But that question about turning life into humor became a key part of my writing process from mid-2009 to early 2010. 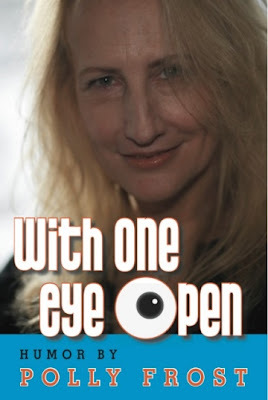 It was the most difficult stretch I ever went through, yet a great number of the humor pieces in my book “With One Eye Open” were written during that time. In the summer of 2009 my brother Daniel, who’d been a gifted cancer surgeon, died of complications from Parkinson’s. He’d gotten it as a young man. The world seemed an irrational and precarious place to me, one that attacked people like my brother for no rhyme or reason. It was hard for me to get much of anything done during that period. But writing humor came easily. That’s because you don’t have to be going through a really happy period in your life to write funny. As most humorists know, bad times can be great times to write comedy. For example, one of the first things that happened to me the day after my brother died turned into a humor piece. I said, “Of course I’m upset! My brother died.” I hung up on her. Now, I’m sure that woman was trying in her own way, but everything she said and did after that just made me angrier and angrier. She wrote me an email about how my brother dying reminded her that her own husband might die, to which I responded that we will all eventually die, but in fact, but her husband was at that moment very much alive while my brother wasn’t. “Go write a humor piece about her,” he said. So I did. My husband knew what he was talking about: she was a gift. Actually, she inspired not just one, but several humor pieces! In life she was someone I never wanted to see again, but on the page she was someone I eagerly looked forward to writing about. I cite this example because I often get told by other writers -- writers who aren’t professional humorists -- that they’d like to be funny, but don’t know how. Here’s my advice: stop trying! Trying to be funny is the surest way not to be. If you think about actors who portray comic characters, the ones who are the funniest are the ones who take their characters the most seriously. It’s the same thing with writing comedy. You have to take your character very seriously and take their tragedies seriously. If you do that, you’ll find the comedy in the character. If you’re open to it, life will constantly give you hilarious material. You just have to get it down and not get in the way of it. That’s your job as a humor writer. Laurie Hertzel fell into journalism after taking a job as a clerk at the Duluth News-Tribune and is now is the books editor at the Star Tribune in Minneapolis. She's been a fellow at Duke University, a writer-in-residence at the James Thurber House in Columbus, Ohio, and a faculty member and speaker at the Nieman Conferences on Narrative Writing and Editing at Harvard. Oh, and let's not forget that she has spectacularly great hair, a hilariously dry and warm wit, and she's written an absolutely wonderful book about finding success in the newspaper world despite herself. I'm tickled and honored to have her here. Thanks, thanks, thanks, Laurie. You write that everything you did happened by accident, but wouldn’t you also say that your passion and drive opened doors? You call it passion and drive, I call it single-mindedness. I have always had very limited skills—I am no good at math, I can’t carry a tune, I’m not handy or crafty, all I can do is write. So instead of trying to learn how to do those other things, I put all my focus into trying to improve as a writer. When opportunities came along—the Duke fellowship, the Russia trip, and there were others—I focused on getting them with a sort of laser-like intensity because I knew it was do those things, or do nothing. And I have never been very good at doing nothing. I also think that not finishing college was, in some ways, good for me—it made me feel, constantly, like everybody else knew things I didn’t. And so I tried very hard to learn, and I sought out opportunities like fellowships and conferences, trying to get up to speed. I love the story of how you called your first interview with a quavering voice because you were so shy, yet despite this timidity, you still got out in the world, and subsequently wrote a terrifically intimate book. How does a shy person balance that need to be in the thick of things to get the story with the desire to hide in a room? That notebook was a great shield. It gave me permission to go places I would never have gone otherwise, to talk to people I would never have met and to ask questions that I wouldn’t dream of asking otherwise. It gave me permission to be bold. You might be surprised to learn that a lot of newspaper reporters are actually fairly shy people. In my experience, there are two kinds of reporters—the brash, gregarious, hard-charging kind, who get a certain kind of story, and the quieter, more observant kind, who get an entirely different kind of story. Your love for Duluth is palpable. Do you ever get back? Do you miss it? Do you think geography defines us? Well, that’s an interesting question, about geography. Do I love smallish towns and rugged seasons and nature at my doorstep because that’s the kind of place I grew up in? Or was I just lucky to be born in a place that fit me? Certainly there were plenty of people—some of my siblings among them—who couldn’t wait to get out of that town and move on to bigger cities or more temperate climates, but clearly I wasn’t one of them. When I moved to the Twin Cities, I knew that I could not settle permanently on an urban street surrounded by houses and pavement. And so we were lucky, after a year or so, to buy a house right on a park. That park is a crucial part of my life; I walk the dogs through it every morning, ride my bike along its paths, stare out the window at the trees and the lake. It has hawks and eagles and groundhogs and otters and, sometimes, an occasional fox. I need that constant reminder that we are all part of nature, that all that is urban once was wild. I do get to Duluth once or twice a year—Doug and I pass through on our way up the North Shore a couple of times a year, and we go to Duluth now and again to visit friends. I miss the city because it was so familiar to me, and I knew it so well, but I’m not sure that I still know it. It has changed a lot since I left. And I don’t know if I could live there again. What fascinated me was that while you were a journalist, you felt driven to write fiction, and did so successfully, winning fellowships, and yet you gave it up to be back in the thick of a newsroom. Do you ever miss it or feel the pull of it calling you back? I don’t think I have enough of an imagination to write good fiction. I am pretty grounded in fact and reality, and I am literal-minded to a fault. It’s true that I wrote a couple of short stories, but they were all based at least somewhat on things that had happened to me, and they were all of a type: first-person, focusing on small events that held larger significance. I think one reason I was drawn to fiction was that it allowed me to write in a more intimate way than traditional daily journalism allowed. With fiction writing, I paid attention to certain mechanics—pacing, symbolism, openings, closings, dialogue, scene, summary—and then tried to translate what I had learned to reportage. Do I miss writing fiction? For all that I think I’m no good at it, I do miss it, sometimes. I miss seeing the world the way I did when I wrote short stories. I found the stories of how the old newsroom changed (women infiltrating all men offices, clattering typewriters changing to computers) hopeful in the light of the metamorphosis they are going through today. Are you optimistic about the future of newspapers and where do you think they’re headed? I have to be optimistic. I am optimistic. My newsroom and newspaper seem to have stabilized. My husband’s newspaper (he works for our competition) has shrunk considerably over the last ten years, but it, too, seems stable now, in its new reduced size. And I do not think a democracy can thrive without a free and inexpensive and widely distributed press. I am no good at predicting the future. But I think print journalism will stick around for a long time because a lot of people still like paper. And Web journalism, without a doubt, will continue to grow. I miss those old days, though. They were fun. Reading your book, I got the feeling that you’re going to do something surprising next—that you’re always somehow evolving. If newspapers were to end today, what would that be for you? I love this question and it is the one that has kept me from dashing off these answers quickly and getting them back to you immediately. I am stuck on this one. Sometimes I think I could do anything—go back to school and study earth science! Work for a nonprofit! Go into retail! But in truth I have no idea. You can be sure of this, though: whatever happens will absolutely be by accident. I LOVED finding in our book that you say at an interview you should always ask what question you should have asked but didn’t—I’ve been asking that for all my blog interviews since I started them. So…what question should I be mortified that I didn’t ask you? Oh, goodness. You could ask about the nature of memoir. You could ask about how peculiar and awkward it is to be the books editor at a newspaper, trying to promote my own book without compromising my job. You could ask about what it was like to grow up in such a gigantic and, um, passionate family. But I think you asked great, and enough, questions on your own. Kate Ledger’s Remedies, now in paperback, is the kind of intelligent page-turner I absolutely love. A portrait of a marriage, a study of a doctor’s life, and a look at the kind of grief and pain that affects both the body and the soul, Remedies is a knockout. Of course, after reading it, I wanted to seek out Kate and we met through Facebook, Twitter and even e-mail. Remedies is also an Indie Next Notable Book, a Self Magazine’s Book Pick and the official “Community Read” of the 2009 twin Cities Jewish Book Fair, Remedies was also selected as an Ingram Premier Pick, a top book recommendation to libraries across the country, and it's racked up the raves. I'm thrilled to have Kate here on my blog. What's it been like publicizing your book? Like most writers with new books, I was doing everything I could to get the word out that my novel, Remedies, exists. I have helpful publicity support through my publisher, but I also decided to take a real grassroots approach on my own. I went to Amazon and looked at reviews of books that I thought were similar to mine, either in themes or style. I found a review you’d written (of Roxana Robinson’s Cost), and I wrote you an e-mail asking if you’d care to read Remedies. Your response to the request was so surprised and so genuine, and so supportive of the sheer effort, I was really heartened. Someone should compile a list of writers’ guerrilla tactics to get their books noticed. I’d love to know what other writers have dreamed up. Maybe that list exists—I haven’t seen it. Have you tried other guerrilla tactics? Nothing too crazy. A lot of earnest letter-writing. My husband went on a business trip to Denver and stopped in a bookstore to tell them about my novel. He passed a guy wearing a giant placard, pacing back and forth in front of the store. On the way out he asked the guy what he was doing. The guy said, “I’m trying to sell my novel!” I haven’t done that. It’s a hard thing, having spent years of your life creating an imaginary world, honing and crafting a book. Then someone—an agent, an editor—declares their faith in it, and all of a sudden, all that time was worth it. The sentences you were perseverating over become a beautiful entity with a cover and a spine. Your heart soars. Then reviewers say lovely things about it. The hair stands up on the back of your neck as you sit at your computer reading your name on other people’s websites. Your mother and mother-in-law buy a lot of copies. All of this is great, but getting the word out is still a challenge. You want people to know about it. You want people to read it. You want to talk about it with them. How did you first conceive of this novel and how did it evolve? I came to this story, first and foremost, imagining a situation. I think that’s how I always begin writing fiction: What’s a circumstance that really intrigues me? When I teach writing, I suggest to students starting from a place that has resonance for them, an event or a context they’d like to sink their teeth into. I know there are writers who can dream up a character and then let the character wander around and see what happens, but I don’t start there. I think it’s helpful to start from a place where you’re fired up by the problems or the direness of the circumstances. Imagine a life event that’s dramatic and even problematic and then figure out who the people are who get themselves into that kind of circumstance—then see how they resolve it. My very first thought for this novel was: what about a doctor who discovers a cure for pain? The question grew out of the medical magazine writing I do for a living. I’d met many doctors and researchers who’d come up with amazing and even life-saving treatments for patients. Some of those treatments, when first introduced, were contrary to the scientific thinking at the time. That’s astounding to me—you can hear all the tension that’s possible. On top of that, pain seemed like a fascinating and complex topic to focus on: It’s subjective. You can’t measure it. Treating it depends on the trusting relationship and the honest communication between the patient and the doctor. And a cure could really change the life of someone who’s suffering. But the burning question was really about character, and that absolutely consumed me. What would a person be like who could introduce a new, miraculous treatment? How would he think about the world? I began to imagine the character of Simon Bear, who believes he’s discovered a miracle treatment. (To be honest, as I began to flesh him out, I first imagined he was a doctor who was bored with his career and then stumbled across something magnificent. But I discovered that it’s actually quite boring to write about someone who’s bored!) I changed courses and imagined Simon as someone teeming with ideas and confidence. He has tons of plans for things he wants to do, even if he doesn’t get to them. As I probed deeper into his character, the key became why: Why would this person do what he does? Over time, it seemed Simon’s desire to treat other people’s pain came from an inability to address his own. Then, I realized I wasn’t just writing a story about a professional circumstance. I was, instead, writing about a more intimate world, a broken marriage, and deeply emotional strife between people. This novel took ten years to write. Did you know it would take that long? I didn’t realize it when I began. Back when I started, I told my husband—who wanted a sense of the schedule ahead—that I thought it would take five years. It seemed like a reasonable number. Then time stretched out as I worked on it. I also freelanced for magazines, we moved five or six times, and I had three kids. Each time, I’d get interrupted and then come back to the novel. Even my procrastination was pretty productive: I also wrote some poems that were published in literary magazines and two screenplays. But the novel was my main professional goal, and even when I wasn’t working on it directly, I was thinking about the characters, adding layers to their backstories, coming up with new scenarios and encounters. Make no mistake: there was a lot of angst involved. I believed in my heart I was capable of reaching the end, but I didn’t know what it would take to get there. But I was glad in the end that it took ten years. I think the time, and my own development as a human being, enabled it to be a richer book. Becoming a mom brought a huge change in my perspective. I hadn’t even considered the possibility that the couple in the story had lost a child until after my own had arrived. There was a day when I was thinking about the characters, trying to figure out why they were suffering so terribly, and I turned the question on myself: what was I most afraid to see on the page? What was I terrified to write about? I was terrified to write about losing a child. Once I thought it, the emotion it came with was so deep, I felt I had to write about it. It was a different book after that. What kind of thinking went into the masturbation scene on the first two pages? Without a doubt, there are things that will always make you nervous to write. There are things that will make you nervous to read. It’s always interesting to take stock of where your comfort zone ends. That’s the point of art, it seems to me, discovering those moments we feel at home and those moments we feel on edge. It seemed a gritty start to a book, and that seemed okay. I didn’t worry too much about offending anyone. My deepest sense was the masturbation scene fit really beautifully with the themes of the novel, and that was what I cared about most. Simon Bear has a strained relationship with his wife Emily. They lost a child years ago and have long avoided grieving. But now that distance permeates their entire relationship. She sleeps with eyeshades on her eyes and earplugs in her ears. I imagined Simon waking and masturbating on his own. The scene underscored the loss of intimacy between them and his very basic yearning to reunite with her. But even the way he thinks about the action reveals him. Simon has created a sense of his selfhood through his identity as a doctor. He thinks of his self-pleasuring in physiological, clinical terms. My take on the world is that we all need that selfhood, but when it’s based on our professional successes, the identity has a hollowness to it. I hoped the reader would take note of that hollowness from the very first page. And then there are themes throughout the book about sexual excitement, the way it quickly fills the space of sorrow but doesn’t necessarily provide intimacy or contentment. Actually, I could write pages about the meaning of that scene. 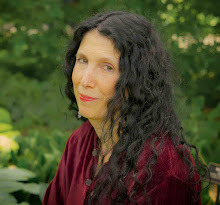 Another important aspect was this: once I had realized the metaphoric significance of masturbation, I felt it was my duty as a woman writer to be brave and put it on the page. Philip Roth wouldn’t have shirked away. Nor James Joyce. Have you been talking about the book with readers? What has that experience been like for you? What kind of advice would you give writers who are working on first novels? Don’t give up. Keep asking yourself hard questions—and answer them. Be brave. I don’t know of a book that was ever better because of what a writer chose not to say. And on a practical level, get an office. Writing from home, with the scatter of life around you, is one of the hardest things to do. Kevin Canty is smart, funny, generous to other writers, and brilliant. There, I said it. You want to buy him a beer and have pizza with him and then watch the conversation happen. Everything, his new novel, is a sublime study of love and yearning, loss and need. He's also the award-winning author of the novels Into the Great Wide Open, Nine Below Zero, and Winslow in Love, as well as the short story collections Honeymoon and Other Stories, A Stranger in This World and Where the Money Went. His work has been published in The New Yorker, Esquire, GQ, Details, Story, the New York Times Magazine,Tin House and Glimmer Train. He currently teaches fiction writing at the University of Montana. You have no idea how thrilled I am to have him here. Thanks, thanks, Kevin. "Everything" seems to be a Valentine to Montana, where you live, and it seems appropriate to me that such an expansive, everything kind of environment would form the backdrop to a novel about people who want (and keep failing to have) the same majesty they see around them in their lives. Can you talk a bit about how place impacts your writing, both in your daily life as a writer (could you be a writer in Chicago?) and in the world of your novels? It’s one of the ironies of writing that you get to the big stuff only through the small stuff. I mean, you do get to talk about Time and Life and Fate and Truth but only by a kind of close observation of the lives around you, and a reenacting of those lives in language. I’ve been living in Montana for many years now and these are more and more the lives I know, and thus the lives I write about. Are they much different from lives elsewhere? Probably not. But they are people who have an emotional attachment to this kind of landscape. It’s a hard place to make a living and a long winter; you really have to love it here to stay. And these mountains, these rivers are what we have instead of restaurants and museums. Right now, in late summer, hot days and cool nights and caddis hatches in the evening, it’s hard to want to be anywhere else. I think I could be a writer anywhere, though. It’s just a matter of paying attention. The big-ticket items don’t change from place to place: parents get sick, children grow up, people fall in and out of love. Somebody in Ohio is getting kissed for the very first time even as we speak! Everything is filled with the messy sorrows of growing older and the desperate yearning for love and new lives, that don’t go as planned, yet there’s this divine optimism in the novel, too. Was that planned or was it a discovery as you wrote? I’m not big on planning novels. I feel like they go dead on me if I have too clear of an idea what might be in front of me; I like to know a little but still retain a sense of curiosity about the way forward. This seems to keep the writing alive for me. Everything was written out of a really chaotic time in my life, a moment when so much that had been stable for so long began to fall apart. My father died. A thirty-year marriage ended. My friend Buck Crain, to whom the book is dedicated, was losing a fight with cancer. I fell head-over-heels in love with a woman, then broke up with her. So trying to make sense out of this moment is both the subject and the action of the book. The search was genuine. I was trying to figure out a way to respond to these upheavals and writing this book was a part of that attempt. In some sense I finally got that optimism beat into me—I wasn’t about to give up, right? had to find a way forward—and so do these characters, I think. I read in an earlier interview where you said that teaching writing was bad for you. Why? Do you still feel that way? Well, just to disagree with myself for a moment, teaching has been very good for my writing, in the sense that it’s given me the security and time to pursue it. Certainly it takes time and intelligence and emotional energy to teach, especially if you want to do a good job of it, which I (mostly) do. But the tradeoff is that I get to have a mortgage and my kids get dentistry and college educations and so on. I’ve tried to write and hold down a job in the “real world” and I found it difficult and worrisome and draining. So in that sense I’m grateful for the alleged ivory tower. It’s the only job I know where there’s time for writing and reward for writing built in. I think what I was talking about before was a kind of moral hazard in being the authority, in having answers to questions and solutions to problems. The real work of writing is dark and mysterious and sometimes dangerous, I think. Sometimes the thing that gets described in a writing workshop is not quite the real thing. You see a lot of the same problems, especially with undergraduate work, and you prescribe the same solutions, and if you’re not careful you can falsify the whole business with easy answers. Would you talk about the structure of this novel? There are no chapters, which made the reading seamless for me, and the lives are separate threads of the whole, and the whole novel takes place in a year. Was this a conscious decision from the get go? Usually I have no idea on the way into a piece of writing whether it’ll be a novel or a story or a failure or whatever. I just have a few shiny objects and I try to connect them up and see what happens. This one was a little different, though. I’d been reading a lot of 19th century novels and kind of fell in love with the inclusiveness of the form, the layers of incident, the moral and psychological complexity, the big casts of characters and the multiple points of view. So I had an idea on the way into this book that I wanted to use some of that ambition and some of that furniture. But I didn’t want to write the whole 900-page enchilada. What I was trying for was to write the individual bright moments and then let the reader make the connections between them for him or herself. I feel like this novel was driven in part by trying to find a form that combined the things I’d learned from reading Tolstoy and Dickens with the things I’d learned from Raymond Carver and Joy Williams. You never finished high school and your bio says it took you 20 years to get your degree. Now that’s interesting enough to make you a character in a novel yourself. How did that come about? Did you know early on you wanted to write or did it just happen when you finally got to college? Why didn’t you finish high school? I quit high school mainly because I was really, really bored. It wasn’t much more complicated than that. I just felt like there were a lot of things that were a lot more interesting than high school, and I was right about that. I ended up working as the white hippie kid on an all-black construction laborer’s crew and then hitch-hiking to California and going backpacking through Rocky Mountain National Park and so on. It was fun. The rest of the resumé is a bit misleading. After a year of high-quality screwing around I got my GED and came to college here in Missoula. I was lucky enough to get a really good education here, drifted into writing after a while, first poetry—which I studied with Richard Hugo, among others—then fiction. Bill Kittredge was a great teacher, Missoula in the 1970s was a great scene, wild and wooly. I was also interested in music, though—if I was a better guitar player, I might not be a writer at all—and I didn’t have the discipline to finish anything. So I sort of drifted out of the writing world and into the music world for a decade or so, about 15 credits shy of a degree. I think I always had a weird certainty that I would end up as a writer, though. When I decided to go to grad school I was living in Portland, Oregon, running a sound company. I came back to Missoula, camped out in my sister’s basement for a semester, finished up my 15 credits and we were off to the races. You’ve said, “I’m only really writing when I don’t know what I’m doing,” which, I think, is one of the most reassuring assessments of the writing process I’ve ever read. At what point do things start to coalesce for you and make you believe that your pages are indeed a novel? I don’t usually have very good ideas about things until I start to write them. Every story needs to have its own shape and its own music but that only comes into focus for me in a kind of negotiation between what’s already on the page and what might happen in the future of the story. That sounds horribly abstract, I know. What actually happens is that I sit around Googling my friends and writing bad sentences and trying titles out and playing bridge with my computer and then once in a while something comes along that feels like it’s alive. Then you just cut out all the dead stuff and try to write other sentences that seem alive that go with the alive sentence you just wrote. What’s obsessing you right now? Not really obsessing about anything these days, playing guitar, walking the dog, spending a lot of time at the river, trying to catch a few fish and working on my sandal tan. I want to go back to teaching in the fall with tan feet. It’s the mark of a sincerely misspent summer. I’ll get back to work in the fall, I’m sure—I have several projects in various stages of dereliction—but for now I’m keeping them in the closet and trying to enjoy life. So far so good. Okay, imagine this. You're at the new Julia Roberts movie, Eat, Pray, Love, with friends. The popcorn's in your lap, the drink's in that little holder by your seat. No one's kicking your seat or on their cell phone. Fifteen minutes in, to your amazement, you suddenly see YOUR book in Julia Robert's hands--ten feet high on the screen! You had no idea--the book is out of print, no one told you, no one even mentioned there might be a possibility of this happening. It happened to my friend Randy Peyser. Her book, Crappy to Happy, about Randy's journey back to joy after "going splat on the pavement of life," was featured on the big screen, used to get the audience laughing at a funny self-help title and held face out to the audience. You can't buy publicity like this! Suddenly, there's all sorts of interest in reprinting her book, the phones are ringing, the email is cranking. Eat. Pray. Love. Read. Previews of Coming Attractions, Blessings on PW and how to look at reviews! I'm thrilled to announce that the great Kevin Canty will be here talking about his marvel of a novel, called Everything (I wish I had thought of that title.) Also coming up is the wonderful journalist and Star Tribune book editor Laurie Hertzel, answering my questions about her memoir, News to Me: Adventures of an Accidental Journalist; Emma Donoghue to answer questions about her brilliantly unsettling new novel, Room; and Susan Henderson, who will discuss her debut Up From The Blue, which is already generating so much incredible buzz, that it could start its own hive. I'm also thrilled to announce that I got the lead review in Publisher's Weekly! I want to buy them chocolates or a loft in Soho! They said: "A touching story of loss and discovery. 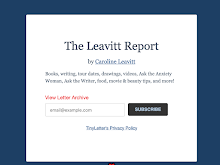 Leavitt explores the depths of grief and the sticky spots sorrow pushes people into, and ...her near bottomless reserve of compassion for her imperfect characters will endear them to readers." Pre-publishing activity is such a state of high anxiety, that you can't imagine how grateful and relieved I feel. I'm incredibly lucky to have such an extraordinary publisher like Algonquin and they are already packing my schedule (yay!) and sending me on tour (yay again!) and doing all kinds of innovative out-of-the-box things for me. But there still is the anxiety about reviews. Reviews are so public (imagine how festive it would be to get ravaged in the press and all your friends and relatives see it, and then they have to awkwardly try to make you feel better, and all it does is make you want to hide in a cave for a few years) and so important, that getting this one has made me feel less like hooking a constant IV of Valium into my arm. The interesting thing is that you never know how reviews will go. I know writers who have gotten horrific PW's and Kirkus, who went on to be the darlings of reviewers. For an early novel, I had stars for both Kirkus and PW, and the novel only received three other reviews! Reading your own reviews can be a dangerous business, too, because honestly, reviews are one person's opinion. I always talk about the one day when I had an extraordinary full-page rave review in The Washington Post and a half hour later, I received a horrific full-page pan in the Philadelphia Inquirer. The Inquirer loathed everything the Post had adored, so who was right? I tend to study every word of every review, trying to figure out, is the reviewer right? Can I learn from this? Do I need to give it up and go to dental school or should I be practicing my Pulitzer speech? In the end, I do what I can. I am praying to the review gods and goddesses, keeping my chin tilted up, and doing what it is writers do in times of stress: I write. For a long time (and I have no idea why I thought this), I believed that every other writer on the planet had an easy time of it. Words flowed from their minds right onto the page! They never had angst or self-doubt or bad days or moments when they seriously considered becoming a dentist instead. Everyone loved them, they got reviewed every place on the planet, their readings were packed, and every thing they wrote was lauded. Now, of course, I know the reality is different different. Writers struggle. Readings of even famous writers are sometimes just the writer, the sales clerk and a man who came in from outside because it was too hot and the bookstore was air-conditioned. As a book critic, I know how space constraints dictate what to review sometimes. And I know it takes me an hour and a half into the writing before something clicks and my characters start to breath. I'm seven chapters (halfway!) into the first draft of my new novel, The Missing One (and I know the title will probably change), and I'm learning once again (because every novel is a new thing) to live in the mix of fear and angst and let's face it, downright bliss of writing. Dental school? Not a chance. Writing a novel is hallucinatory. You get deep enough into the work and the two worlds--the fictional world and the real one--start to blur. I admit it's a state I love. I'm caught between beginning to promote my new novel, Pictures of You, which is exciting and thrilling, and writing my new novel, tentatively titled The Missing One. I'm carrying two sets of characters in my head all the time, and they are talking, talking, talking. But in between life goes on. My niece is having twins! My mother is moving from our family home to live near my sister, which feels sad and strange and the right thing to do. My friend adopted an adorable five-year-old boy! As for me, I'm taking a break and hitting the beach for a few days, and I hope my characters don't want to pack too much baggage. See you in awhile, crocodiles. The Afghan Women’s Writing Project (AWWP) is looking to bring on board three volunteer Creative Outreach Assistants to help in our creative outreach efforts. These volunteers will report directly to the Director of Creative Outreach and will be non-paid positions. Jobs will entail working with the Director and other staff in organizing, planning, implementing, and promoting a national effort to stage multiple theatrical stage presentations of the AWWP’s writer’s works similar to the recent Los Angeles and Washington, D.C. events (See website for details). n Conducting outreach to theatrical organizations to pitch the idea of staging a theatrical event. n Maintaining Creative Outreach website (updating, editing content). n Helping with logistics, planning, and physical staging of events by working with theater companies and their staffs remotely and locally (where possible). n Assisting in the design, writing, and creation of documents, spreadsheets, or other documentation needed to execute all of the above. n Commit at no more than 5 hours per week on promotional and administrative tasks. n Speak English fluently and present solid people skills. n Self-manage—there will be little hand-holding. n Copy edit, proof and correct English with fluency and some style. n Be willing to learn a virtual assistant web application. n Internet and computer literate. n Microsoft Word, Excel and PowerPoint (not necessarily all three, Word is essential). n Some interest in the arts, theater, film or creative writing. 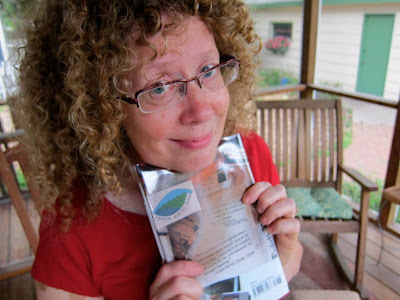 Lisa Unger ask, "What Kind of Writer AM I?"